Since we’re hot and heavy into the Olympics, I thought I’d share some news about a dog from the UK. According to the Daily Mail, a would-be burglar got a rather unpleasant surprise when he tried to break into a seemingly empty home. 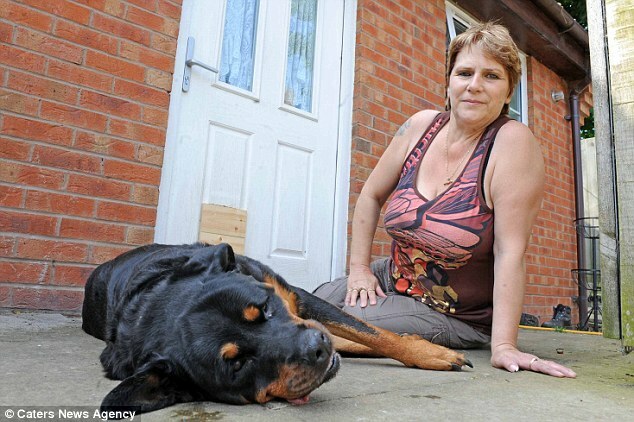 While the family from Leamington Spa, Warwickshire was away, a neighbor had agreed to watch Missy, the 11-year old docile family pet Rottweiler. When the neighbor came to check on the dog, she found blood all over the back door. Seems a burglar had reached in through the cat door, and Missy wasn’t sure she wanted visitors, so she bit him. Forensic scientists were called, and the samples they took from the blood on the porch and on Missy’s teeth led them to catch the would-be thief. Dogs would be unbribable, especially when it comes to loyalty and devotion to their beloved humans, which extends to protecting their property. One can only congratulate this doggie – good work!!! I hope his family didn’t forget to reward him with a HUGE bone to enjoy! I was mugged by a Rottweiler once. I knew he was local because there was still butter on the knife.